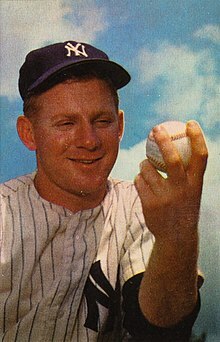 Edward Charles "Whitey" Ford (born October 21, 1928) is a former Major League Baseball pitcher who spent his entire 18-year career with the New York Yankees. He was voted into the Hall of Fame in 1974. ↑ Some sources, such as Retrosheet, claim a 1926 birth_date. "Whitey Ford". Retrosheet. Retrieved 2008-10-22. This page was last changed on 13 April 2017, at 16:51.